Faces of Fourth is a featured series on the folks that are the heart and soul of Historic Fourth Avenue. From the merchants who bring commerce to life, to the buskers who fill the avenue with sound, there are so many people to celebrate on Fourth Avenue. 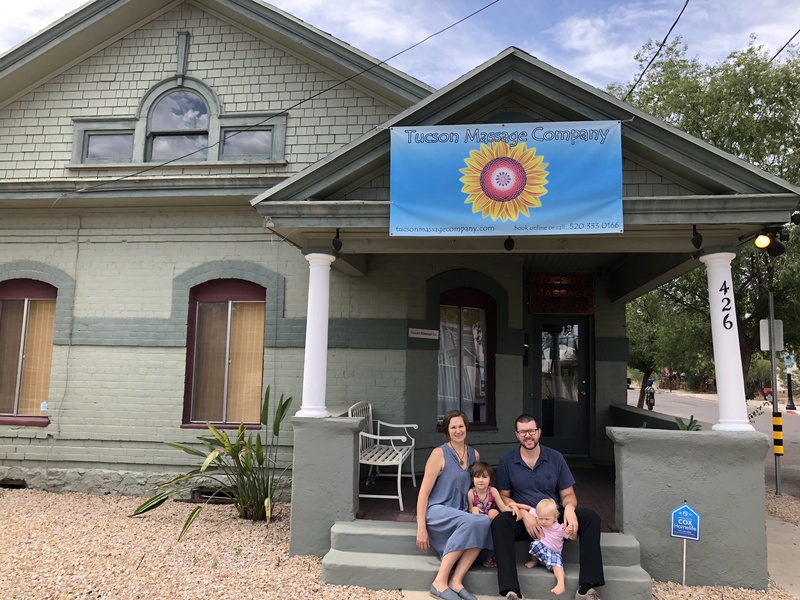 Fourth Avenue is feeling a bit more zen with the addition of the newest local business to join the community, Tucson Massage Company. Owner Don Lockwood and his wife, Charity quietly opened the business after doing extensive renovations of the property at 426 East 9th Street. We connected with Don and his family to ask a few questions and get an introduction to the new business that’s all about self-care and the healing power of massage. Who are you? Tell us a bit about yourself, your background, and how you got to tucson. I’m from Colorado. In 2013 I backpacked in Southeast Asia for 9 months where my body adapted to the constant heat. When I returned home, I wasn’t ready for the cold so I came to Tucson. I met my partner Charity here and 4 years later we’ve got a baby, a toddler and a new business off Fourth Avenue. What do you do on the avenue? When I first arrived on the scene in Tucson I got a job as a delivery driver for Brooklyn Pizza Company during the day shift. I loved the mix of getting paid to explore the heart of Tucson while enjoying the camaraderie of the pizza shop in between deliveries. After a while I enrolled in massage school at ASIS on 6th Ave.
I’m a pretty simple guy. I like beer, food and music. The Avenue has all of those things in abundance. What is one of your favorite places to frequent on fourth? Our business is a skip away from Ermanos Craft Beer & Wine Bar and I go there basically every time I’m working at the spa. I admire what Mark & Eric Erman have done with their restaurant. The beer selection is fantastic and the food is delicious. I took a fall off my bike on the streetcar tracks going at high speed with a heavy grocery bag on one side of my handlebars. The handlebars suddenly turned 90 degrees with a great deal of force and I had so much momentum that I went flying through the air in what felt like slow motion, but I was just an observer like in a dream. My body took over in a “Don, hold my beer” kind of moment and it landed me on my feet and dissipated the momentum with some kind of crazy tumbling move that I couldn’t repeat if I tried and I was perfectly safe. My groceries were fine too and there were no cars around. I have never experienced so much adrenaline, wonder and gratitude in such a tight span of time…it was a kind reminder to take it easy and be more mindful. If you could time travel, what year would you like to visit the avenue? 3-4 years from now so I could come back and make some ridiculously good business decisions. To learn more about Tucson Massage Company, visit: tucsonmassagecompany.com.